A new emergency medical service facility opened Friday morning, Oct. 31 where the former Long Island College Hospital once operated. The facility, renamed NYU Langone Cobble Hill, offers a walk-in emergency room to be open 24 hours a day, seven days a week.Two ambulances will be kept on site in case patients with critical injuries need to be moved to another hospital. The emergency service is temporary while NYU Langone builds a larger medical complex, expected to open at the end of 2017 or early 2018. While there had been calls to open a full service hospital at the site, residents who spoke with NY1 say the new facility is a step in the right direction. "It's an expanding neighborhood, there's a lot of people with kids. I mean a lot of people moving in here, especially here with smaller kids as anyone who's been to a a playground knows. So yeah it's definitely really important to have that kind of resource in the neighborhood and nearby," said one Cobble Hill resident. "At least we've got something going... It's a little hope," said another Cobble Hill resident. SUNY Downstate sold LICH to Fortis Property Group earlier this year for $240 million. Space not occupied by the new facility will be converted to luxury condos. The larger medical complex is expected to open at the end of 2017 or early 2018. While the hospital itself is shuttered, SUNY Downstate has been operating a small emergency clinic out of the former pediatric ER there. NYU Langone has refurbished the space formerly occupied by LICH's adult ER, but has not been permitted to take over its operations pending approvals from the state's comptroller and attorney general for the overall sale of the hospital site to developer Fortis Property Group. which plans to develop condos there. "We are currently completing all site preparations and staff assignments so that NYU Langone-Cobble Hill will be ready to open this Friday, October 31," said NYU spokesperson Lisa Greiner. "The interim location at the renovated, former LICH emergency department site will be staffed by an experienced, interdisciplinary team of more than 100 skilled clinicians and support personnel 24 hours a day, seven days a week," she said. NYU Langone is "currently working with the New York State Department of Health and the FDNY to facilitate acceptance of 911 ambulances as soon as possible," she added. The sale of the 156-year-old hospital has been fought by Brooklyn community groups, officials and staff for almost two years. Advocacy groups contend that the sale is shortsighted, as northwest Brooklyn's exploding population requires a full-service hospital, not a freestanding ER. The group Patients for LICH said in a statement on Oct. 29, "We are disappointed but not surprised that neither ComptrollerThomas DiNapoli nor Attorney General Eric Schneiderman had the courage to stand up against Cuomo and stop the corruption that has marked SUNY's ownership of LICH . . ."
Questions remain including SUNY's obligation to pay back LICH's $140 million Othmer Endowment. 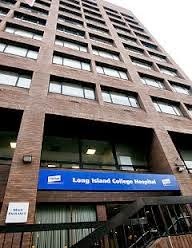 As a condition of SUNY's no-cash takeover of LICH from Continuum Health Partners in 2011, SUNY agreed to repay the money, which had been borrowed. State Supreme Court Justice Carolyn Demarest retains jurisdiction over trust-related issues under the settlement.